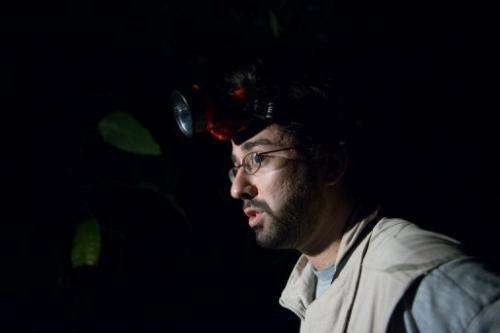 Brazilian biologist Michel Garey looks for frogs at Salto Morato Nature Reserve in Guaraquecaba, southern Brazil, in October 2012. Garey recalled how on his birthday in 2007 he chanced upon what turned out to be a new species of tiny, three-fingered frogs. On a trek across this Atlantic rainforest reserve in southern Brazil, biologist Michel Garey recalled how on his birthday in 2007 he chanced upon what turned out to be a new species of tiny, three-fingered frogs. "I was doing research with two friends on a hilltop in the reserve and I stumbled into this unusual frog with only three fingers," he told a small group of reporters this week on a tour of Salto Morato, a nature preserve owned by Brazil's leading cosmetic firm Boticario. "It happened on February 14, 2007: My birthday. What a treat!" he said. But it was not until June this year that the discovery of this new species—Brachycephalus tridactylus—was officially established. A report on his finding was published in Herpetologica, a quarterly international journal focusing on study and conservation of amphibians and reptiles. "At the time I was doing some other work related to ecology and I figured I could wait as no one else doing frog research would have access to the area," Garey said. "It took me 18 months from early 2011 to collect seven of the new frogs, go to museums to compare them with other species, realize that they were new, write my paper and have it published in the journal." The tiny brachycephalus tridactylus was found at an altitude of around 900 meters (3,000 feet). Its most striking feature is the absence of a fourth finger, which Garey attributes to an evolutionary process rather than to environmental effects. The frog, which measures less than 1.5-centimeters in length, is mostly orange with olive-gray spots and dots on its body. A three-fingered frog, Brachycephalus tridactylus, is pictured at Salto Morato Natural Reserve in Guaraquecaba, southern Brazil. Biologist Michel Garey recalled how he chances upon the species on his birthday in 2007. Garey said the male frog makes around 30 mating calls a day, sounds he described as "a single short note that decreases in dominant frequency from beginning to end." Garey said he could not estimate the frog population, but plans to do so in a future research project. The frog is part of 43 amphibian species found in this 2,253-hectare (5,567-acre) reserve, located in Guaraquecaba, the easternmost city in the southern state of Parana. Experts estimate around 950 amphibian species live across Brazil and more than 6,700 around the world. 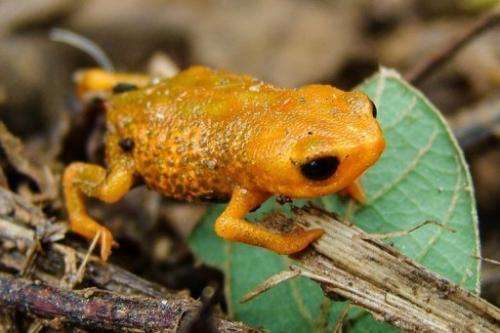 Amphibians—cold-blooded animals such as frogs, toads, salamanders and newts—are increasingly threatened by climate change, pollution, and the emergence of a deadly and infectious fungal disease, which has been linked to global warming. One-third of the known species are threatened with extinction, according to the Global Amphibian Assessment, an extensive survey of the world's amphibian species. More than 120 species are believed to have gone extinct since 1980. Frogs spend part of their life in water and on land, so understanding their complex life cycle is crucial because they can serve as "bioindicators of environmental quality", said Garey. Frogs "have permeable skin which make them more susceptible to ultra-violet radiation and their body temperatures change with the environment," Garey said. "As larvae in the water, they eat various organisms such as algae and as adults they eat insects. The larvae are also eaten by fish while the adults are eaten by cobras and mammals," he added. "So they are having a cascade effect in the food chain." Garey is able to recognize different species by the male's distinctive mating calls. During a night foray into the soggy forest, Garey suddenly bolted into a nearby pond and snatched an unsuspecting bright green frog known as phyllomedusa distincta after hearing its tell-tale call. Garey's interest in frogs began 10 years ago, when he was 19 and studying biology. Today he is a post-doctorate fellow at Paulista State University in Sao Paulo state. His research is funded by the Boticario foundation, a non-profit body which has already sponsored 800 conservation projects, including research and environmental education programs all over Brazil. Salto Morato, created in 1994, protects a significant area of Brazil's dwindling Atlantic rainforest. In November 1999, the reserve was declared a natural heritage site by UNESCO.